The following are revised drafts of the Acceptable Use Policy and PIP. Both documents will be moving forward to the School Board. Please click here to view the results of the Acceptable Use Policy questionnaire. Please click here to view the results of the Acceptable Use Policy Implementation Procedures questionnaire. 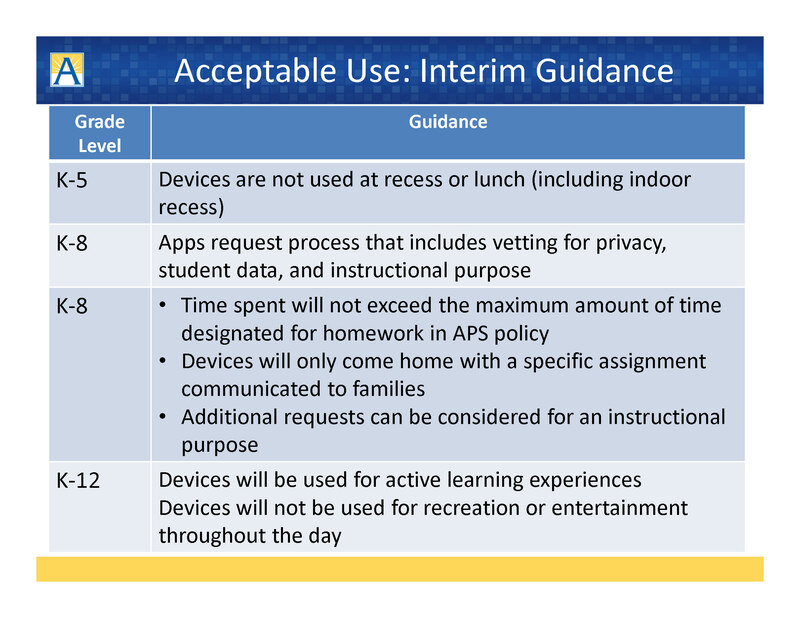 On Feb. 1, the School Board adopted the first APS acceptable use policy for student devices used for learning, which is specific to federal guidelines and filtering. For more information, visit www.apsva.us/engage/acceptable-use/. APS hosted a community discussion on Monday, March 5, on a policy for student devices used for learning. This policy will address such topics as internet safety, digital citizenship, rights and responsibilities, and shared ownership. This is the second of two policies on this topic. The School Board will consider this second policy as an information item on March 22 and an action item on April 5. Please click here to view the results of the Community Feedback form from March 5 meeting held at Wakefield High School. The School Board requested that APS update policies relating to student use of digital devices. Students in grades 2-12 are issued devices by APS. In the November 15, 2017 School Board Work Session presentation, information on current APS policies and examples of policies from other districts were provided. Please click on each link below to view input provided by community members on specific current policies of APS and other school divisions on the Acceptable Use of devices for student learning. Responses are available in Excel format. Each tab contains input on a different policy, be sure to scroll to the right to view all input in columns A and B.
Superintendent’s Advisory Committee on Technology has reviewed policy 45-2 and has suggested edits. Parent resources for using digital technology. Community members can review work session presentations, view the February 1 School Board presentation on the adopted policy related to federal guidelines and filtering and participate in the March 5th Community Meeting on the policy addressing elements such as internet safety, digital citizenship, rights and responsibilities and shared ownership. They can also respond to the online feedback form which will be posted between March 5- 19. November 15: Community discussion (presentation) at Washington-Lee HS cafeteria from 7-9pm on best practices and examples of policies from other districts. November 15 – December 1: Online community input on best practices and examples of policies from other districts. December/January – Advisory Committee on Technology and Advisory Council on Instruction will review draft policy related to federal guidelines and filtering. January 18 – School Board information item on policy related to federal guidelines and filtering. February – Develop draft of second policy addressing other elements of acceptable use such as internet safety, digital citizenship, rights & responsibilities, and shared ownership . March 22 – School Board information item on policy addressing other elements of acceptable use such as internet safety, digital citizenship, rights & responsibilities, and shared ownership . May 17 – School Board action item on policy addressing other elements of acceptable use such as internet safety, digital citizenship, rights & responsibilities, and shared ownership .